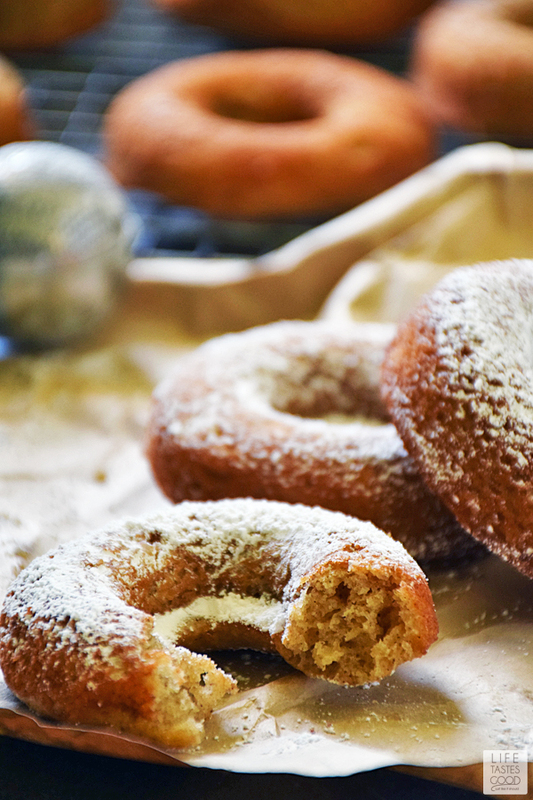 Celebrate the season with freshly Baked Eggnog Donuts! Rich, creamy, sweet eggnog is baked right into these donuts making them the perfect breakfast treat for Christmas morning and to serve at parties this holiday season. Christmas is exactly 3 weeks from today! Can you believe it?! The #SundaySupper Tastemakers are celebrating the season with our Best Eggnog Recipes this week. Eggnog is a traditional Christmas beverage, but it also makes a great ingredient, especially in baked goods. I'm excited to share my recipe for Baked Eggnog Donuts with you today, because it's an easy recipe that tastes a lot like Snickerdoodle cookies! Who doesn't love the cinnamon-y goodness of Snickerdoodles?! When I was testing the recipe for these donuts, I let them cool slightly before taking a little bite to see if they turned out as good as I was hoping. Did they ever! 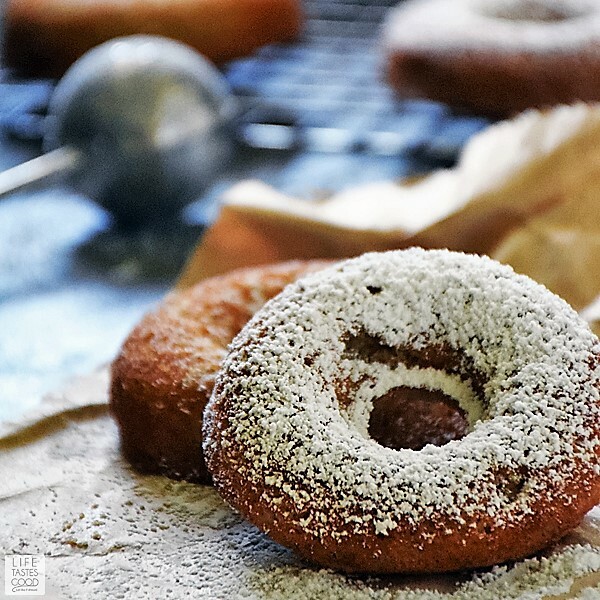 I was going to coat these donuts with an eggnog glaze, but when I realized how much they taste like Snickerdoodles, I knew instantly I wanted to keep it simple. They are so delicious and just adding a dusting of powdered sugar complements the eggnog perfectly. I'm glad I decided to keep it simple! Why cover up such a wonderful flavor? AmIright?! I hope you get a chance to enjoy these donuts this holiday season. The recipe is really easy to make and would be such a nice treat to enjoy on Christmas morning. It only takes about 30 minutes to make these donuts, which is faster than making a run to the donut shop for most of us. I like that! Use quality ingredients for best flavor and results. Take the cold ingredients out of the fridge to come to room temperature about an hour before you want to make the donuts for best results. Although, not absolutely necessary. Measure the flour by scooping or spooning the flour into your measure cup and then level the top for a more accurate amount. If you scoop out the flour with your measuring cup, it is likely to get packed and be too much. Be sure to whisk all the dry ingredients together well before adding the wet ingredients. Same goes for the wet ingredients. Whisk them together well before adding them to the dry ingredients. Mix by hand with a rubber spatula and be careful to not over mix. After pouring the wet ingredients into the dry ingredients, mix just until incorporated. It will be lumpy. Once the ingredients are combined, walk away! That is the time when you set your oven temperature to 400°F and allow it preheat. During the preheating, let the batter sit. This will give you a fuller donut. In a large mixing bowl, combine 1 cup all-purpose flour, 1/2 cup sugar, 2 1/2 teaspoons baking powder, 1 teaspoon cinnamon, and 1/4 teaspoon kosher salt. Whisk to combine and aerate the mixture. In a medium bowl or measuring cup, whisk 1 egg and add in 3/4 cup eggnog and 5 tablespoons melted butter. Whisk to combine. Make a well in the center of the dry ingredients and pour the wet ingredients in. Using a flexible, rubber spatula, gently fold the ingredients together. Fold until the mixture is just combined. It will be lumpy. Just make sure you get all the flour off the bottom of the bowl and combined with the wet ingredients. Stop mixing as soon as the ingredients are combined. Now, walk away!! Step away from the batter!! It needs to rest to allow the baking powder to activate. 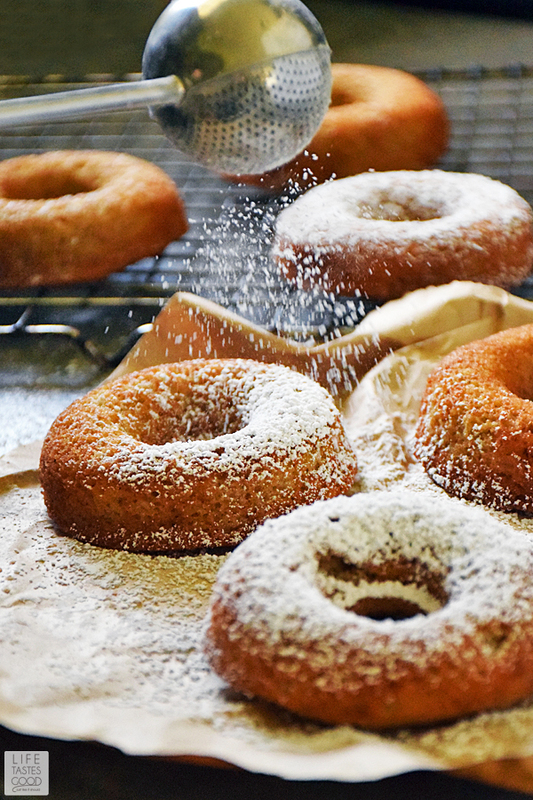 While the batter is resting, preheat the oven to 400°F and spray the donut pan with baking spray (the kind with flour). Once your pan is ready, keep your hands busy, so you aren't tempted to stir the batter. I usually clean up my mess or even leave the kitchen all together until the oven is ready. When the oven is ready, I grab my greased donut pan and scoop the batter into a piping bag. Do not stir the batter!! Pipe the batter into the donut rounds, filling them about 3/4 full. You can use a storage bag with a small hole cut into one corner to pipe the batter. It doesn't have to look pretty, but piping makes it easier to get the batter into the donut pan. This recipe should make 10-12 donuts. Bake the donuts in the preheated oven for 10 minutes or until the top bounces back when pressed lightly. Oven temps vary, so the baking time will vary. Leave the oven door closed during baking. When the donuts are ready, remove them from the oven and allow to cool about 5 minutes in the pan. 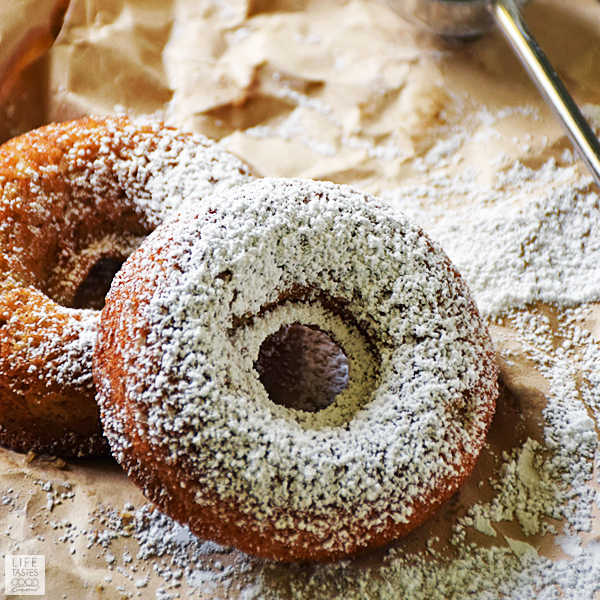 Loosen the donuts and carefully remove them from the pan to a cooling rack. 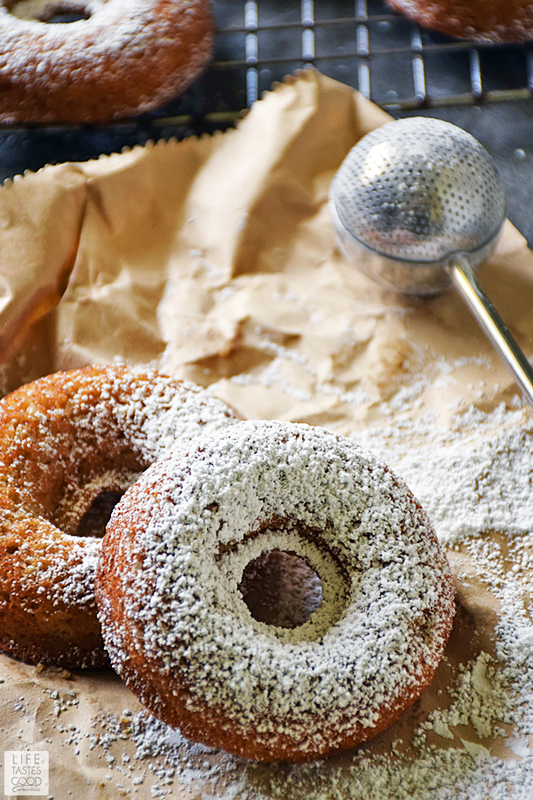 When the donuts are cooled completely, give them a generous dusting of powdered sugar and enjoy! Glazes are over rated. Beautiful donuts!